What type of marketing people do businesses need? I want to make a claim. I think that many marketing people are simply project managers and administrators rather than business entrepreneurs. Part of the reason for this lies in two tendencies. 1. Being given communications tasks of any sort from adverts to branding. The aim is to sell what the firm has not generate new value propositions and business models. This is actually a passive rather than proactive role. 2. Being trained in marketing analysis and decision making on conventional business school courses. Where collection of facts and describing ‘what’ matters rather than speculating on ‘so what’ and ‘now what’. What this means is that marketing people are deemed by the C-suite to be useful but lacking in commercial teeth and risk taking behaviour. If you are a marketing professional you need to understand and be able to create and capture value. You need to generate commercially credible value propositions not indulge in emotional purpose and identity crafting as a goal in itself AND design competitive business models that blend value, relationships, channels and revenue making. What’s your favourite theory of motivation? This is mine. Forget Maslow and Vroom, Pavlov and Skinner this the social psychological view of motivation that unpicks intention and power. Have you worked anywhere where this isn’t the case? Customer knowledge and insight is the fuel that drives business success. You can learn from the experts by entering this amazing free prize draw before November 15th 2018 for a chance to win $1600 worth of marketing books an online b2b marketing course and 2 free consultancy sessions. Will You Be A Winner Of These Amazing Get To Know Your Customer Day Prizes? 1 online course ($797 value) Designed and delivered by winners of the Sheffield Business School Inspirational Teacher Award Dr Simon Kelly and Dr Paul Johnston together with CEO of Shake Marketing and co-author of Value-ology Stacey Danheiser. Knowing your customer relies on the art and science of making the perfect fit between what your customers are looking for and the product and service solutions you are offering. Now I find it hard to imagine that anyone in business these days isn’t customer centric. Ever since Philip Kotler published his article The Generic Concept of Marketing back in the 70s the idea that understanding customer needs is crucial to business success is virtually common sense. That said not everyone is good at and not everyone cares. I’m always amazed at Gordon Ramsey’s TV programme Kitchen Nightmares where he rescues businesses from failure and 9 times out of the 10 they lack any understanding of what their customers need and how they feel about the service and food. A few years back I worked for gambling company and the typical phrase in the buidling was about the ‘little old ladies who play our coin-op games’. The whole place ran on a myth. When proper customer research was done it was discovered that the key customer a young man, typically in a trade, single and who spent a lot of time socialising in pubs and bars. So, one of the big problems I have come across is the assumption that product designers sales and marketing know who the customer is but often a quick conversation in the company and what comes out is no one really knows. There are lots of anecdotes about typical customers and often who the customer really is (the biggest purchaser, what they really need) isn’t know. the ability to anticipate what people in general will need in their lives in the medium to long term. What sort of fuels will they use? How will they learn? What will the new space science industries need? Ultimately it’s about showing an interest and caring about what people want and willing to pay for. If you can make their lives easier or improve their business then you are on to winner. Who should drive the sales and marketing team training agenda. The HR manager or the Sales and Marketing manager? When it comes to developing the skills and practice of the sales and marketing team who should be driving the training agenda is it the sales and marketing manager or the HR manager? In larger organisations the planning for staff training lies under the broad remit of HR who, following training needs analyses create people development programmes and decide whether these are ‘make or buy’ decisions. Any sales and marketing executive who abdicates the training job entirely to HR is missing a trick. Local and specific needs are always spotted first by the people in the function. They can also see what training is relevant. If they don’t step up then team training and education is likely to be quite ‘vanilla’ such as general leadership, problem solving, or communications programmes. The problem with this is that sales and marketing professionals often think ‘so what’ about this type of training and the reputation of their HR colleagues goes through the floor. The other challenge is the time commitment. Sales and Marketing people, especially Sales people are actively engaged with daily customer demands so time for development creates a conflict of priorities. At the heart of this problem lies the issue of formal vs informal learning. Social learning platforms are the ideal solution to this dilemma. With an on-line course busy professionals can dip in and dip out to suit their availability and learn functionally relevant skills at their own pace. What should Sales and Marketing teams be learning? One of the biggest challenges faced by any sales and marketing professional is how to generate more sales and profit and deliver customer value. 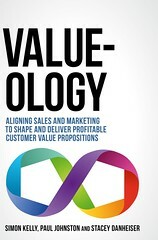 Fundamental to this is learning how to create compelling customer value propositions. This is crucial in the face to face context of B2B marketing. You simply won’t get specialised training on the vital subject of value proposition design with general sales and marketing development courses and it is unlikely that the topic is on the radar of the HR manager (please prove me wrong!) This is why we have created a complete on-line informal learning course on the value proposition creation and customer value building. Something you can invest in yourself, bring to the attention of the HR manager or simply buy with the sales and marketing budget. Based on our top selling b2b marketing book Value-ology: Aligning sales and marketing to shape and deliver profitable customer value propositions the course is made up of video topic presentations and individual and team exercises based on a mix of our commercial experience, our university tutoring and our commercial and academic research. The module content is designed to be practical, straightforward and accessible so the emphasis is on management learning not abstract academic studying. You can even do the course on mobile devices. A full explanation of the course can be seen via this link. Click this image to learn more course details. If you are looking for ways to inspire, engage and develop your b2b sales and marketing team then this course is definitely for you. After reading this you’ll ask yourself why do I need to study marketing at university? Let’s be honest, you might be interested in learning new things and at the same time you don’t want to devote time and energy into formal study and assessment. That’s why on-line learning is perfect for busy marketing and sales professionals. University and college are great places for formal learning on-line business courses are ideally suited for informal learning. If you want to discover how to drive more sales, increase profit, align sales and marketing and create customer value our new on-line b2b marketing course will be perfect for you. It’s ‘dip in -dip out’ format means you get the nuggets of wisdom you need from short video presentations when you need them and you can follow this up with individual and team exercises that will help your business beat the competition. Check out the course now by clicking the logo. Did you know Customer-centric organizations are 60% more profitable than non customer-focused companies. And while that stat is compelling, we’ve found that organizations struggle to become “customer-centric”. Off to Marseille to the IMP Conference this is the leading source of thought leadership in business to business marketing. Dr Simon Kelly and I are presenting two papers on the sales and marketing interface and the role of practice based research for doctoral research.